A romantic mermaid silhouette is made all the more glamorous with a gorgeously beaded belt attached at the natural waist. 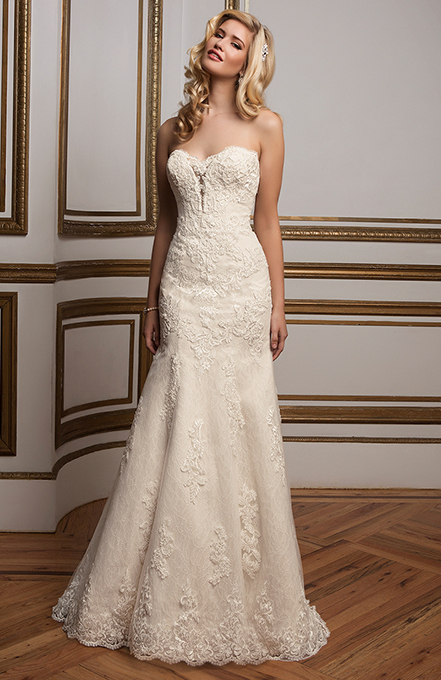 A classic sweetheart neckline on a beaded, corded lace over Chantilly lace bodice perfectly balances the beautiful scalloped hem lace at the ends of the skirt and train. Shimmering crystal buttons along a center back zipper polish off the look.